Moringa Oleifera leaves and pods contain 90+ nutrients, 46 antioxidants, and 36 anti-inflammatory compounds. Researchers are calling it the most nutrient rich plant on earth. 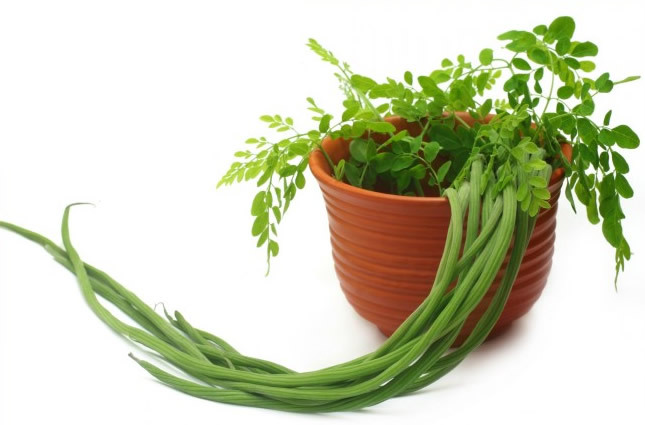 Every part of Moringa Oleiferais useful. Many parts of the tree have traditionally been used for treating many diseases like lung diseases,hypertension, chest infections, everyday aches and pains as well as skin infections. Much scientific research on the moringa plant has come to the conclusion that it is extremely nutritional andmedicinal. The benefits have also been documented in some medical and nutritional journals as well. Moringa Oleifera is among the popular power greens such as wheat grass, chlorella and spirulina. 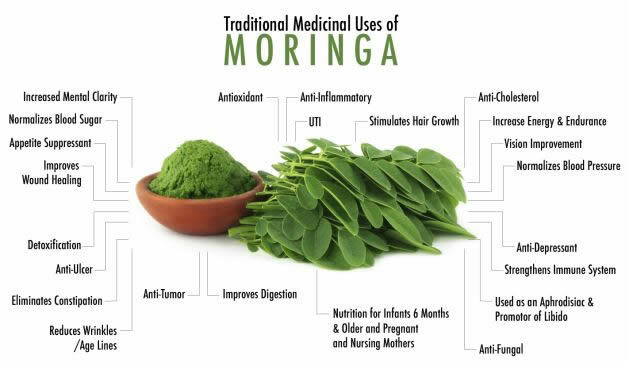 Moringais rich in minerals like potassium, iron, calcium, and sulfur, as well as B vitamins and many amino acids,including all of the essential amino acids. Its nutritional profile is competitive with any beneficial plant onthe planet. Each Bottle contains one (1) month`s supply. 60 Capsules. 400 mg each. Imagine capturing the entirety of benefits of the Moringa Tree, the "Tree of Life" if you will — all in one capsule. You can. We hope you try Moringa for your good health, there really isn`t a more prolific plant on the face of the earth that`s looking out for you more than Moringa! Read further to see the nutritional value of 100% Jamaican pure Moringa! Moringa Oleifera leaves and pods contain 90+ nutrients, 46 antioxidants, and 36 anti-inflammatory compounds. Researchers are calling it the most nutrient rich plant on earth. Moringa oleifera is a species of tree native to the Himalayan Mountains of Northern India, now cultivated across Southeast Asia, Africa and South America. Packed with a full spectrum of nutrients, Moringa oleifera is the most nutrient-dense plant ever studied. Moringa leaf powder is a natural plant product for general health that promotes cardiovascular, neurological, prostate, vision health, proper digestion, energy and a normal healthy immune system support. Moringa leaf provides antioxidants, proteins, vitamins, amino acids, flavonoids, fibers, minerals, chlorophyll, beta carotene and phenols benefits. Moringa leaf powder has more than 90 essential nutrition compounds. Moringa leaves are about 40% protein, with all of the 9 essential amino acids present in various amounts (histidine, isoleucine, leucine, lysine, methionine, phenylalanine, threonine, tryptophan, valine). Moringa is considered to have the highest protein ratio of any plant so far studied on earth. Moringa has protein quality and quantity similar to soy beans, but there are no reports of Moringa triggered allergies, so it can be used for baby nutrition replacing soy. Moringa is not genetically modified or altered by humans. Vitamin C: Just one ounce of Moringa leaves contains the daily recommended amount of Vitamin C (60 mg). In fact, it is so rich in Vitamin C that, ounce per ounce, it contains 6-7 times that found in orange juice. Vitamin C strengthens our immune system and fights infectious diseases including colds and flu. 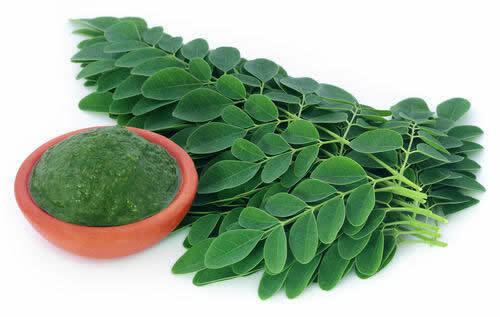 Vitamin E: Moringa contains large amounts of Vitamin E, at 113 mg per 100 g (about 3 oz) of the dried leaf powder. The recommended daily intake of Vitamin E is 10 mg. Vitamin E is a potent anti-oxidant that helps prevent premature aging and degenerative diseases including heart disease, arthritis, diabetes and cancer. It also protects the body from pollution, increases stamina and reduces or prevents hot flashes in menopause. It promotes young-looking skin, as well as healing and reducing scar tissue from forming. Vitamin B2 (Riboflavin): Moringa leaves compare with broccoli and spinach in Vitamin B2 content. Vitamin B2 is required for the production of energy, proper use of oxygen and the metabolism of amino acids, fats and carbohydrates. It is needed to activate vitamin B6 and assist the adrenal glands. It is important for red blood cell formation, antibody production and growth. And it is required for healthy mucus membranes, skin, and for the absorption of iron and certain vitamins. Vitamin B3 (Niacin): Moringa leaves and pods contain about 0.5-0.8 mg of Vitamin B3 per 100 grams (about 3 ounces). Recommended daily intake is 18 mg. Vitamin B3 is important for energy production and metabolism of protein, fats and carbohydrates. It supports the function of the digestive system and promotes healthy skin and nerves. Vitamins B1, B2 and B3 work synergistically. Other minerals that Moringa contains include selenium, zinc, magnesium, phosphorus, copper and sulfur. Moringa oleifera leaves and seeds contain beneficial essential fatty acids (EFA`s). Moringa seeds contain between 30-42% oil, with 13% saturated fats and 82% unsaturated fatty acids. Oleifera is the Latin term for `oil containing.` About 73% of the Moringa oil is oleic acid, while in most beneficial plant oils, oleic acid only contributes up to 40%. Olive oil is about 75% oleic acid, and sunflower is about 20%. Oleic acid is linked to lower rates of cardiovascular disease, neurological disease, artherosclerosis, infections, and certain types of cancer, and it helps to regulate blood glucose levels. CHLOROPHYLL: Moringa is one of the few foods that contain chlorophyll together with so many other nutrients. Chlorophyll is often referred to as the `blood of plants`. Studies have shown that it supports liver function and detoxification of the body. 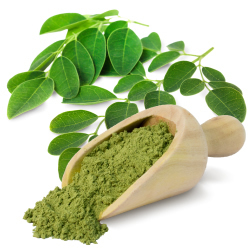 ZEATIN: Biochemical analysis has revealed that the Moringa leaves and leaf powder contain unusually high amounts of plant hormones named cytokinins, such as zeatin and the related dihyrozeatin. Scientists have found zeatin in very low concentrations in plants, with zeatin concentrations varying between .00002 mcg/g material to .02 mcg/g. The zeatin concentration in Moringa leaves gathered from various parts of the world was found to be very high, between 5 mcg and 200 mcg/g material, or thousands of times more concentrated than most plants studied so far. Cytokinins function as plant hormones, which are naturally occurring growth promoters and factors that delay the process of aging in many plants. In cultured human cells, cytokinins have proven to delay biochemical modifications associated with aging. Zeatin has potent antioxidant properties and has been shown to protect the skin and increase the activity of known anti-oxidant enzymes that naturally fight aging. It has also been shown to protect animals against neuronal toxicity induced by age specific factors, and in the laboratory setting, to inhibit cancer cell growth and induce their differentiation back into normal cells. LUTEIN: Moringa has extraordinary amounts of lutein. 100 g of leaves contain more than 70 mg, while the recommended daily amount for the best protective antioxidant activity is 5-20 mg for an adult. Lutein promotes healthy eyes by reducing the risk of macular degeneration. CAFFEOYLQUINIC ACIDS: Moringa leaves contain 0.5-1% caffeoylquinic acids, coming very close to the content that makes artichokes famous. Caffeoylquinic acids are antioxidants considered to be choleretic (bile increasing which helps to digest dietary fats), hepatoprotective (effective against hepatitis and other liver diseases), cholesterol-reducing, and diuretic.